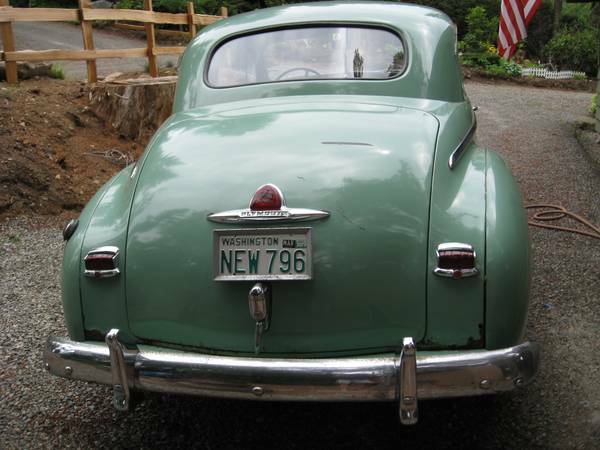 In a 1949 advertisement, Plymouth boasted “Engineering magic greets you right from the start.” And sure enough, it did, with a stunning 2hp boost over the previous year, due to a raised compression ratio. The advertisement also mentions some kind of automatic choke system, which is rather surprising for the immediate postwar years, when a car basically had to have 4 wheels and an engine to be successful. 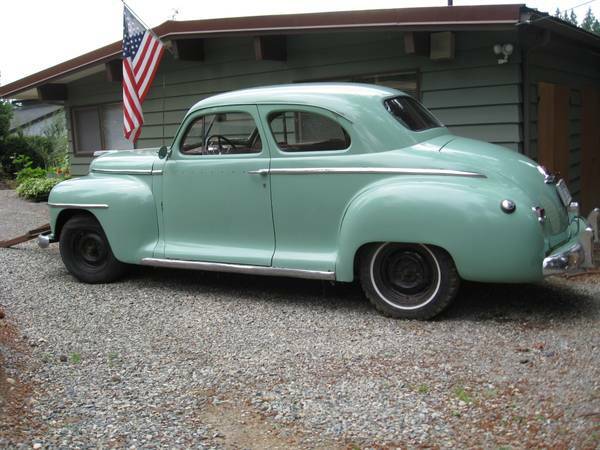 Against the pre-war based Fords and post-war styled Chevrolets that were its competition at its debut in 1946, it looked quite modern, but in the year our feature car was built, it looked dated compared to the new 1949 shoebox Fords, which no longer showed any trace of the separate-fender era. However, with 65 years gone by, these cars are quite compelling as classics – simple mechanics and equipment. 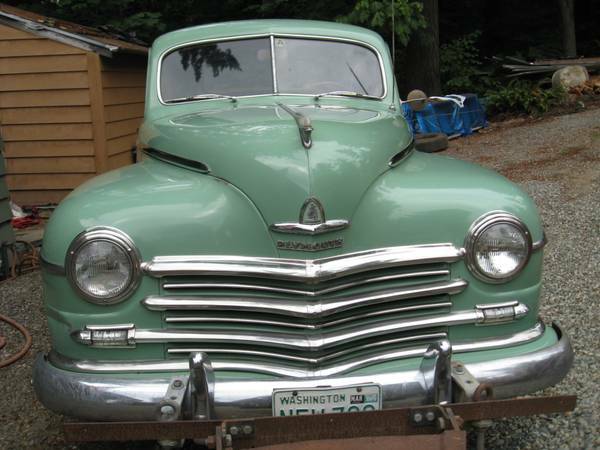 You can find your collector car bargain in <a href="http://seattle.craigslist.org/skc/cto/4280586514.html&quot; title="1949 Plymouth Special Deluxe Club Coupe for sale” target=”_blank”>this 1949 Plymouth Special Deluxe Club Coupe (what a mouthful! ), for sale in Auburn, WA for $2500. The car has apparently been parked since 1979. It seems to be missing its hubcaps, but if those are not included, it might be a nice opportunity to slightly upgrade the look. Although it seems odd to use this car, already a classic by 1979 standards, in the snow, it is equipped with snow tires on the back. While you might never drive it in the snow, it’s kind of cool to see it set up as it might have been for, say, winter 1952. The seller claims to be the second owner, and the car has been stored under cover. The car is said to have 130,000 miles, to be complete, and comes with extra parts. So perhaps those caps are on the summer tires? The paint has a nice gloss to it, and the rust is not very visible. Hopefully, it’s limited to the extent it’s visible, and not just poorly painted over filler you can’t see in pictures. The old Washington plate is a neat touch – are you allowed to keep those as Californians can keep their old plates? It’s not clear whether this is the original interior upholstery – one would expect such an entry-level car to have monotone leather/synthetic seating. It does look like a period-correct cover, though, and perhaps the pattern you can see showing through and on that small portion of the seatback is the real stuff. 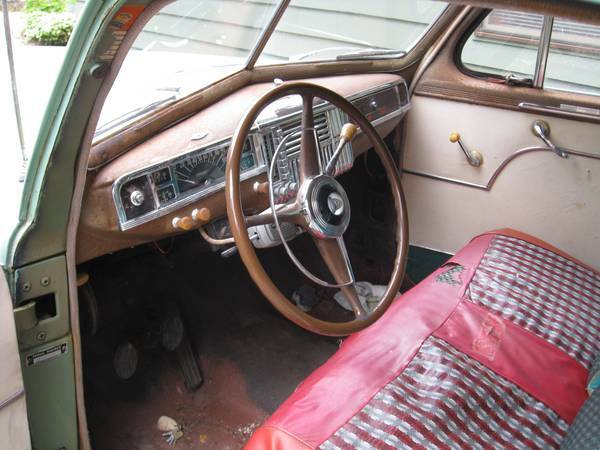 Either way, the interior looks well-used and old, but not in a bad way. Here’s the nose – fairly elaborate by post-war standards. What is up with the bracket on the front? Trailer hitch for towing behind a motorhome? Or do the rear winter tires mean someone tried to use this as a plow vehicle? Overall, this looks like a great opportunity for someone who can live with a little rust (isn’t that why you’re here?) to do a mechanical refurb, drive around some post-war subdivisions and get a small insight into their parents’ or grandparents’ experience. This entry was posted on January 13, 2014 at 11:14 am and is filed under Feature. You can follow any responses to this entry through the RSS 2.0 feed. You can leave a response, or trackback from your own site.